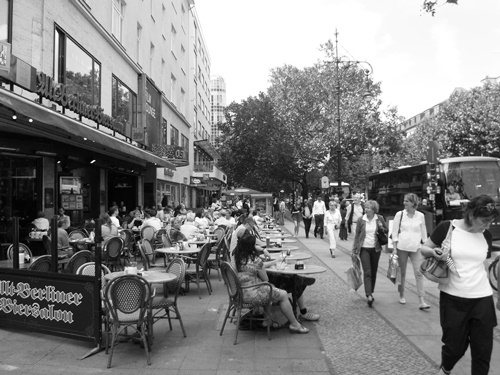 “And so the Kurfürstendamm stretches out endlessly day and night. Also, it’s being renovated. These two facts need to be emphasized, because of the way it’s continually ceding particles of its true self to its designated cultural-historical role. Even though it never stops being “a major traffic artery”, it still feels as though it weren’t a means to an end but, in all its length, an end in itself” – Joseph Roth, What I Saw. It still does. Predictions of the “death of the West” have come and gone over the past two decades since the fall of the Wall, as attention on the city moved across the Tiergarten to the historic centre of the city, but whenever I return to the Kurfürstendamm – infrequently – I am always struck by the fact that the street and the neighbourhood around it are doing fine thank you very much, regardless of the hype and the development going on over in Mitte. On the walk I passed first through the streets closest to Zoo, lined with hotels, theatres, souvenir shops and the high-street favourites, past street-hawkers playing the cups and balls game, one eye out for the authorities who are actually only twenty metres away, making a note of the number-plate of the illegally parked. Further down and the Ku’damm offer changes. Now we are in the rarefied air of the Luis Vuitton and Armani shopper, the stores of global fashion brands manned by sharp-suited and handsome security guards. I felt underdressed even on the pavement. 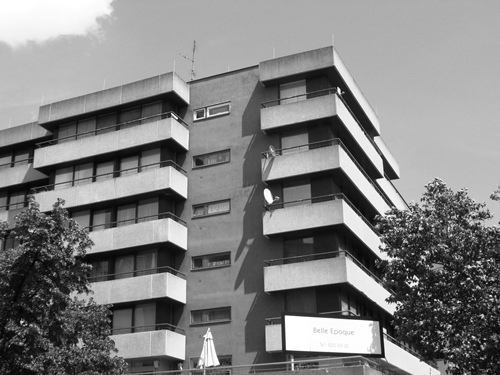 Further still and the street’s character changes again, with more residential blocks and shops catering for locals – supermarkets, chemists, florists and a bakers – the apartment blocks boxy and brutalist, in contrast to the high-ceilinged, high-rent Altbau at the bottom end. Same street, different world. 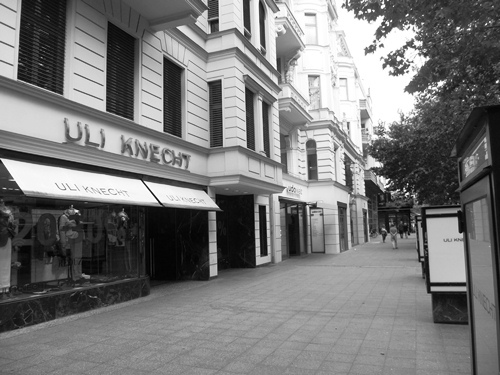 There are still hotels out here, and on the Ku’damm anyone can stay, whether five-star or none, but the residences available on the sidestreets further out are distinctly faded in the glamour, the Berlin version of the backstreet Blackpool boarding house. Money does not flow so freely out here, so the happy couple that had splashed out on a stretch Humvee limousine ate their lunch at a normal-looking Chinese restaurant. I came across the scene as they were leaving, the wedding party standing out on the pavement to wave them off in their ludicrous vehicle, before producing cigarettes from suit pockets, handbags and a photographers satchel, once the newly-weds were safely out of sight. 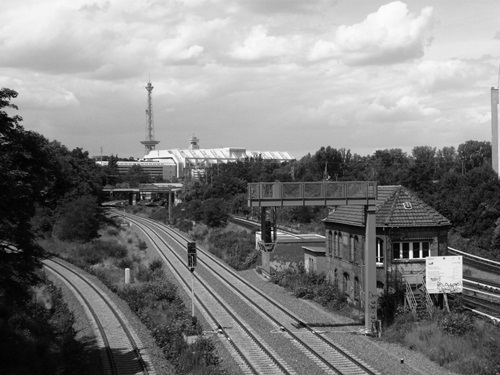 At the furthest end, by Halensee station, I crossed railway lines and wasteland, with a view of the ICC and the Radio tower to one side, and the chimneys of a power station to the other. 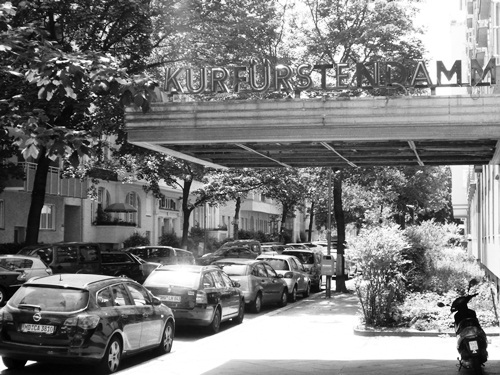 Looking on a map later, I could see that this – the start or end of the Kurfürstendamm depending on your point of view – is hemmed in by motorways and busy road, the apartments of the neighbourhood left to deal with the roar of road. 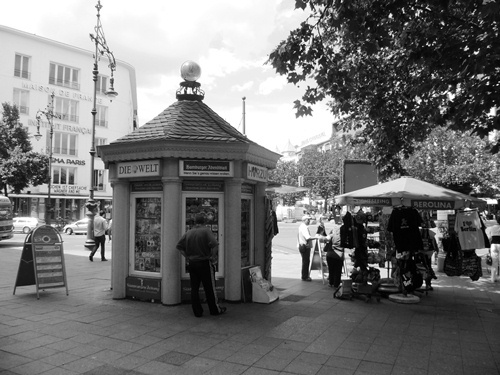 At Rathenauplatz I reached a roundabout and the last of the Ku’damm. A little further on was the villas of the rich in the Grunewald, and the naked bodies sunning themselves by the Halensee, but I had come to the end of my route. 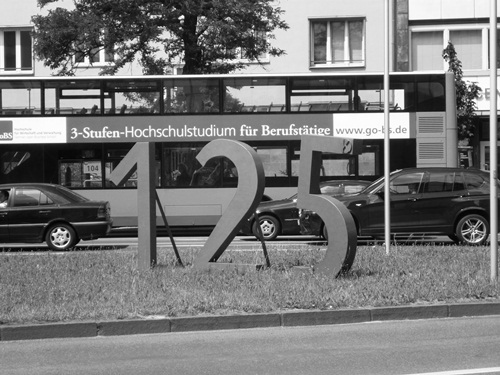 I walked the roundabout clockwise, around the sculpture marking the 125 year anniversary of the Kurfürstendamm in 2011, and then took the opposite side of the street back to where I started, marvelling once more at the many different characters of the Ku’damm with each step. 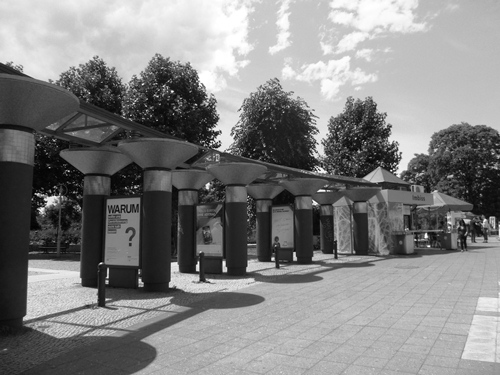 For some more Ku’damm history, check out this post on the Cabaret Berlin blog, about the Luna Park – Berlin’s answer to Coney Island – that stood at the Halensee end of Ku’damm back in the 1920s. 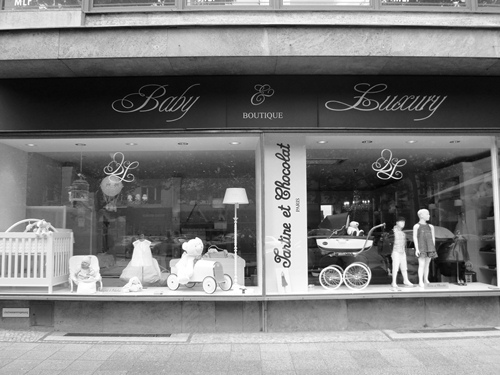 This entry was posted in Diary, Gallery on June 25, 2012 by Paul Scraton. What a coincidence! It’s very long, so I think I will be dipping into it rather than reading it at a full stretch. We shall see! That looks great. I really enjoy the collections of Roth’s non-fiction, especially the sketches in What I Saw, which are so incredibly evocative, supremely observant, as well as being beautifully written. I would be interested to see how his letters compare!